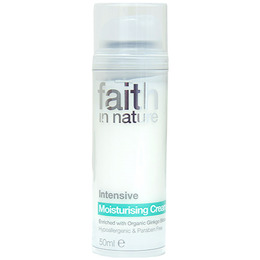 Intensive Moisturising Cream helps to restore the skin`s natural balance. Enriched with organic ginkgo biloba and olive oil for extra replenishment and protection. Aqua, Cocos nucifera oil**, Glyceryl stearate SE*, Glycerin*, Helianthus annuus seed oil*, Aloe barbadensis leaf juice**, Prunus amygdalus dulcis oil*, Stearic acid*, Olea europaea fruit oil**, Simmondsia chinensis seed oil*, Butyrospermum parkii butter*** , Cucurbita pepa seed oil*, Ginkgo biloba leaf extract**, Cetearyl olivate*, Tocopherol*, Parfum*, Sorbitan olivate*, Citric acid*, Sodium benzoate, Potassium sorbate, Xanthan gum*, Limonene°, Linalool°. Apply Intensive Moisturising Cream to a perfectly clean face and neck in upward and outward movements. Use frequently. If irritation occurs stop use. 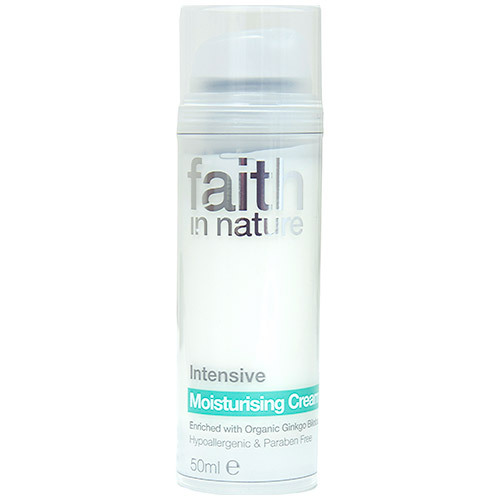 Below are reviews of Faith in Nature Intensive Moisturising Cream - 50ml by bodykind customers. If you have tried this product we'd love to hear what you think so please leave a review. This has got a lovely texture and feels really soft on my skin. It's a great night cream. I would use it during the day too but it doesn't have SPF in.